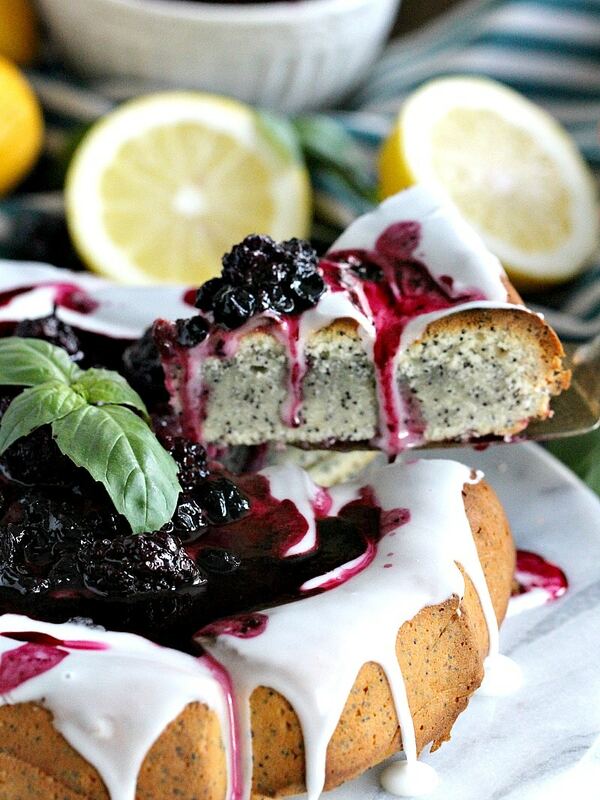 Lemon Poppy Seed Cake is very easy to make, topped with lemon glaze, brown sugar, roasted berries and a few fresh basil leaves. Making easy, puffy and delicious cakes is our specialty. 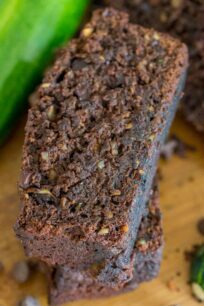 We enjoy making them rich and tender like our popular Chocolate Banana Bread, Skinny Blueberry Banana Bread and Pumpkin Bread. I have been making this Lemon Poppy Seed Cake for years. It’s a foolproof recipe, only you have to keep an eye on the baking time. I love poppy seed desserts, they remind me of my childhood. Also, I think the poppy seeds add such a nice crunchiness to silky desserts. 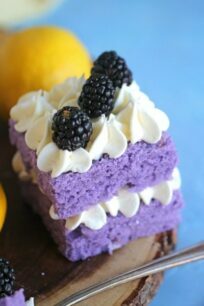 The cake is very simple to make, just a few ingredients. 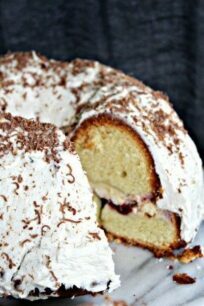 In addition, it is a dense and silky cake, made with cream cheese, so its extra rich. No baking powder is added, to keep the cake denser. 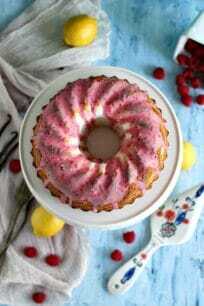 The cake is so flavorful, made with fresh lemon zest and lemon juice. 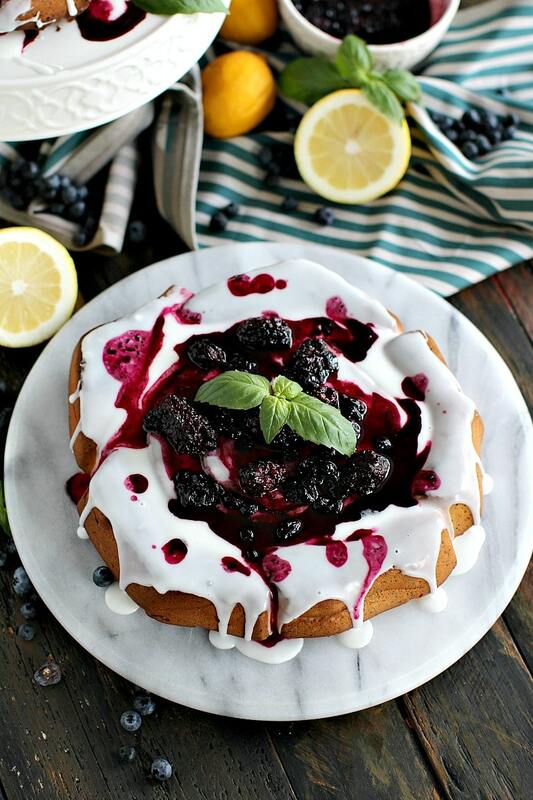 When decorated it looks stunning, the simple vanilla glaze is the perfect bed for those roasted berries and the basil leaves add a pop of color and freshness. The cake can be stored wrapped in plastic wrap at room temperature for 4-5 days. Next, grate the yellow skin of the lemon only. Grate just enough to get through the yellow skin, this way you can avoid the bitter white pith underneath. Lastly, rotate the lemon and repeat. Once the white pith is exposed, rotate the lemon and zest the next strip of peel. 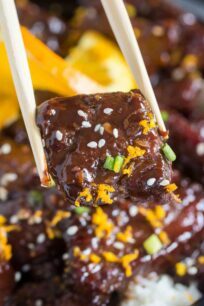 Repeat until most of the peel is removed, or until you have enough zest for your recipe. This cake also freezes well. 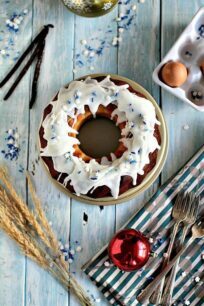 First, cool the cake completely and do not glaze it, if you intend to freeze it. After, fully wrap it in plastic wrap, tightly. After that wrap in aluminum foil or place it in freezer bags. Freeze for up to 3 months. Defrost before slicing. 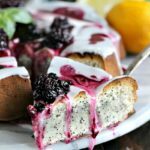 Lemon Poppy Seed Cake is very easy to make topped with lemon glaze, brown sugar, roasted berries and a few fresh basil leaves. 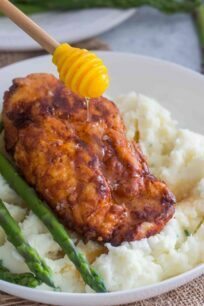 Grease with butter or baking spray a bundt cake pan and set aside. In the bowl of a stand mixer, beat cream cheese at medium speed until creamy for 5-6 minutes. Gradually add sugar, poppy seeds, lemon zest and lemon juice, beating at medium speed until light and fluffy. Add the eggs, 1 at a time, beating just until combined. On low speed, add 2 cups of flour to the mixture, followed by the milk and ending with the remaining 2 cups of flour. Beat on low speed just until fully blended. Transfer the batter to the prepared pan and level the surface with a spatula. Bake 1 hour and 20 minutes or until a long wooden pick inserted into the center comes out clean, start checking for doneness after 60 minutes of baking. If dividing the batter into two smaller baking pans, start checking at the 50 minutes mark. For muffins, check after 25 minutes of baking. Cool in the pan on a wire rack for 15 minutes, remove cake from pan, and cool completely on a wire rack. Add the berries to a small sized baking dish (a pie dish works fine), sprinkle the berries with sugar and coat in coconut oil, gently mix everything to make sure all the berries are covered in coconut oil and sugar. Bake for 15 minutes. Once the cake has cooled, add powdered sugar and lemon juice to a medium bowl and whisk until fully combined and smooth. If the mixture is too thick add 1 teaspoon of milk, the mixture must be thick but still pourable. Pour the cooled glaze over the cake, let it stand for 10 - 15 minutes, top with the roasted berries before serving. Garnish with fresh basil. Your photos are really good! 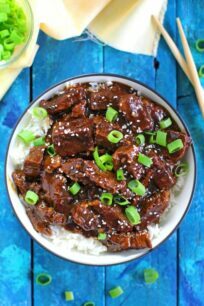 This is a recipe that I’d like to try! Thanks for sharing! 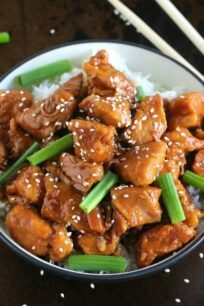 Oooh yum! So many delicious flavors – it looks divine! 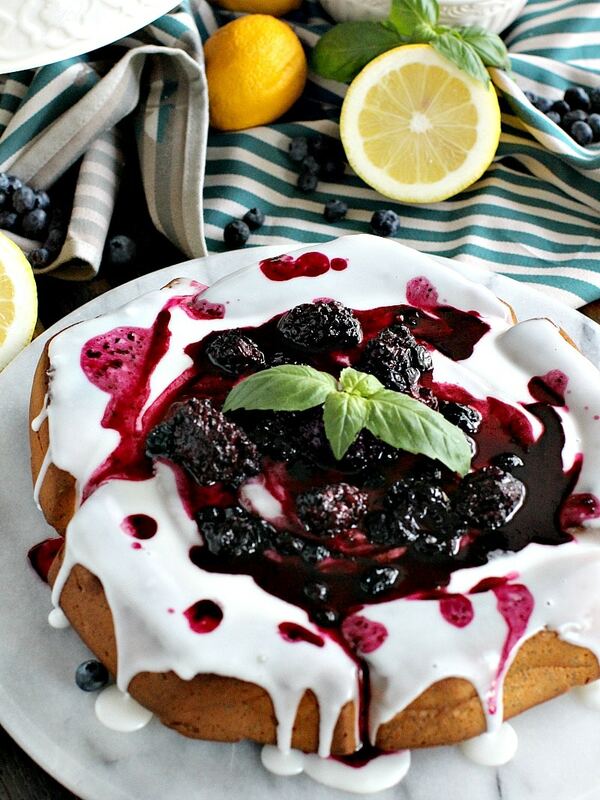 Poppy seed cake is one of my favorites, and I love the lemon and berry twist here!